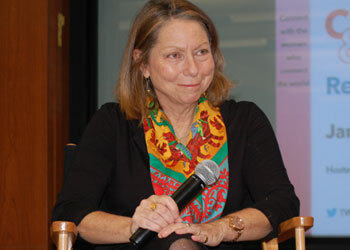 At a New York Women in Communications event last Friday, fired executive editor for The New York Times Jill Abramson sat down for a candid conversation about reinvention and the art of coming out on top. The talk was moderated by “Today” show weekend anchor Erica Hill. Recalling the unfamiliar experience as someone catapulted into the center of a media frenzy following her ouster last spring, Abramson — who said she actually prefers being referred to as the fired executive editor — mentioned “winging it” as she dealt with the aftermath. She handled the press on her own and tried to focus on carving out her next chapter, even as a tabloid stationed itself outside her apartment building. From the moment I was fired… I was aware I was the first woman to hold what many people consider to be an elite job in journalism. It was important to me, from the first minute, to show what I was made of, to try to be an example. If I’ve devoted my career to anything, it’s to telling the truth. So when I was called up given this news, I was handed a press release saying I had to sign it to leave. There is just no effing way. I have devoted my life to telling the truth and I’m being fired, and that’s what I’m going to say and what I want to say. I don’t want the absurdity like why on earth would I have decided to step down? Nutty. Spend more quality time with the dog? Despite the somewhat bloody ending, I love The New York Times. I think it’s an irreplaceable institution in Western civilization. If it somehow went away, it would never be built again. It’s a magical thing. I luxuriate in its coverage every day. I read it exclusively digitally. In an exclusive interview with FishbowlNY following the event, Abramson discussed eradicating double standards, plans for the subscription-based startup she is launching with Steve Brill (in which one long-form story will be published a month) and whether she ever sees herself returning to the newsroom. FishbowlNY: What kind of pressure did you face as a woman in such a high-profile role at the Times? Jill Abramson: Pressure accompanies almost any job that has a public profile. But there’s a lot of pressure involved with just what you do in being a reporter and asking people uncomfortable questions. That doesn’t come naturally to most of us. The process of dealing with pressure is ‘steeling yourself’ to stay calm and carry on. FishbowlNY: If a man was fired and described as being tough, that’s often praised whereas if a woman’s fired and she was tough, it’s not always looked upon the same way. Your thoughts? Abramson: I think there is a double standard, of course there is. FishbowlNY: What can we do about it? Abramson: If you’re saying we as women and as women journalists, what we can do is not perpetuate the stereotypes and how we write about people. Take an extra minute to examine if I’m describing someone as tough or too hard-charging or abrupt or pushy. Actually, a friend of mine who’s a jewelry designer — after I was fired, she designed jewelry that said, ‘Pushy’ and it took off.